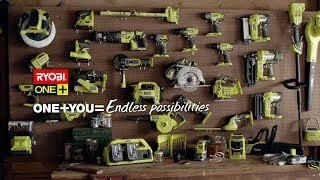 Leave no job half done with the RYOBI ONE+ 18V 2.5Ah 3 piece combo kit. This handy kit comes with 3 essentials of any workshop to guarantee you’re never mid-task without the right tool. Tackle the fiddly jobs around the home with the 18V drill driver. For your bigger DIY projects, plug your 2.5Ah battery into the circular saw and power through. Then switch out for the 18V angle grinder for that perfect finish. Normally a job with 3 tools takes 3 different leads and power sources. But the RYOBI ONE+ range makes switching tools a breeze. Simply unplug the 18V 1.5Ah battery pack and it’s ready for the next tool and the next job. And having 2 batteries on hand means one can charge while one is in use, so you’ll never have to leave a task undone. Get your RYOBI ONE+ 18V 2.5Ah 3 piece combo kit from your local Bunnings Warehouse today.